Kathy Joseph’s smiling eyes reveal the passion that she feels for her life’s work. 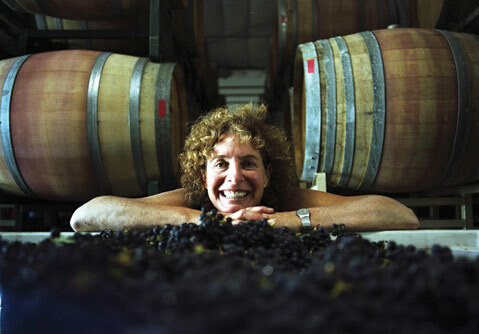 As owner and winemaker of Fiddlehead Cellars, she crafts wines (specializing in pinot noir and sauvignon blanc) that reflect a sense of place through elegant flavors and silky, layered textures. We sat down with the exuberant “head fiddle” to discuss FiddleFest, a June 19 celebration of Fiddlestix Vineyard in the Sta. Rita Hills. Besides plenty of fiddlin’, food, and fun, she explains that guests are offered the unique opportunity to sample 14 vineyard-designated wines made from Fiddlestix Vineyard fruit and to truly experience a sense of place. Which wine first won your heart? Haut Brion Blanc. It has the layers and textures that I crave in pinot noir, but in a white wine. What kind of music do you listen to in the cellar? Honestly, our pinot noir likes everything but country and rap. Explain the significance of mile marker 7.28. It’s the mile marker on Santa Rosa Road where Fiddlestix Vineyard is located. The specific place is really special because it drives the character of wines made from Fiddlestix fruit. The area inspires lots of spice, black cherry cola, sweet anise, sweet tobacco, and delicious minerality. These flavors are substance for great, worldly pinot noir, and mile marker 7.28 is where the magic happens. What would you pour for someone who swears they don’t like wine? Fermenting sauvignon blanc because it is fruity, a little bit sweet, low in alcohol, and is pleasing to every palate. What three words best describe your winemaking style? Textural, textural, textural. What wine trends do you see on the horizon? I think that blogging from personal experience will replace Robert Parker-type reviews, and I foresee more winery-direct purchasing. What are the biggest values on the market today? Besides Fiddlehead Seven Twenty Eight pinot noir, malbec and grüner veltliner. What inspired FiddleFest? We wanted to bring a festival to the vineyard to celebrate the place, the winemakers that express themselves through Fiddlestix grapes, and the wines from this very unique vineyard. What’s the biggest myth about wine you’d like to dispel? That red wine and fish don’t go together. What would you consider your greatest winemaking tool? My palate. What’s the best food and wine pairing you’ve ever had? I like simplicity. A couple of my favorite pairings are sauvignon blanc and a poached egg salad or a dry rosé like our Pink Fiddle paired with paella. What is the most interesting part of tasting wines from a particular vineyard? Sensing the sameness and the differences. There is no substitute for tasting this array of offerings in one special place. What do you enjoy most about your job? The diversity of my job. I love making the wine, running the company, managing the farming, marketing, and, of course, sharing the goods! Join Kathy Joseph at FiddleFest on Saturday, June 19, 1-5 p.m., at the Fiddlestix Vineyard, which is located at mile marker 7.28 on Santa Rosa Road. Tickets are $72.80 in advance and $85 at the door. See fiddleheadcellars.com/events.html for more information or call (800) 251-1225.